Edmund Dudley was the financial agent and English administrator of King Henry VII whilst Richard Empson was educated as a lawyer and was later a minister for the King. 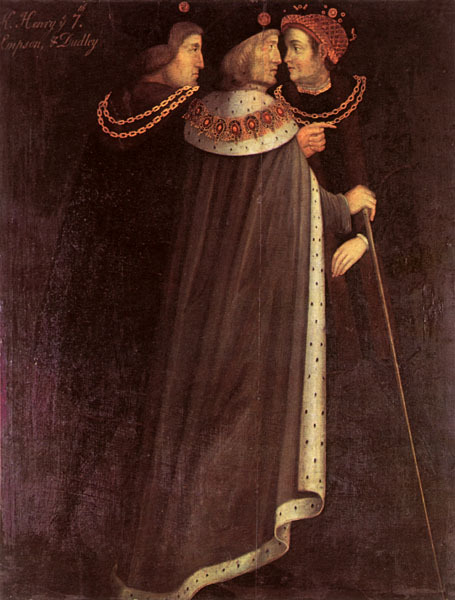 Early in King Henry VII’s reign both Dudley and Empson became associated with each other whilst they were both part of the Council Learned in the Law. The Council was a special tribunal carried out the King’s unreasonable taxations as a result the pair became highly unpopular with the King’s subjects but at the same time the King took a strong interest in the two men and soon elevated them to knights of the shire. At the same time as collecting taxes for the King the pair also became wealthy themselves. When King Henry VII died in April 1509 Dudley and Empson were arrested on 24th April 1509 and imprisoned by the new King, Henry VIII on the charge of constructive treason. The pair were accused of ordering their friends to gather in arms when it became known that the King was dying however, they were also unpopular with the rest of the court which resulted from their financial gains. Dudley and Empson were taken to the Tower of London where Acts of Attainders were put forward to the Parliament the Act was passed against Empson however, the Act against Dudley was not confirmed and Dudley believed that he would be pardoned. During his imprisonment Dudley wrote a treatise in support of absolute monarchy called The Tree of Commonwealth a plan to gain favour with the new King, his writing never reached the King. Dudley and Empson were taken to Tower Hill on the 17th August 1510 and executed.